Squares! 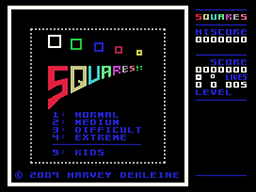 is a fast-paced game where you need to avoid the other squares, anticipating their movement, to last as long as possible and obtain a high score. 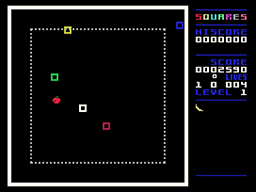 Throughout the game, the enemy squares will continuously bounce around the outer solid playfield. 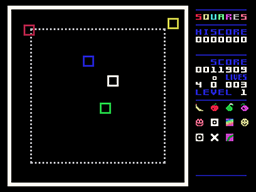 Your white square is bounded by the inner dashed playfield. Use the controller to guide your square away from enemy squares. Your score increases as long as your square is in play. The gameplay will become more difficult as your score increases. You start with 5 squares (10 for the kid's version). 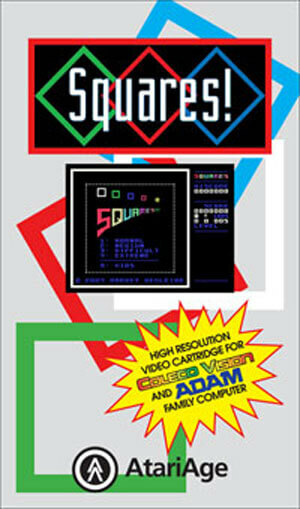 If your square is hit by an enemy square, your square disappears, and the squares remaining will decrease. 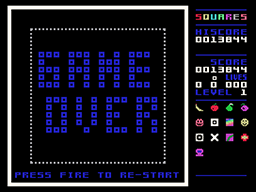 If you have squares available, one will automatically appear near the top-left of the screen (after a short delay and when the area is clear of enemy squares). Momentarily press the left fire button to make your square appear instantly. The game is over when you have no more squares available. Occasionally, a treasure will appear on the playfield (including fruit and other items). If you catch the treasure, either you will be rewarded with an extra square, or you will be given invincibility and hyperspace credits. If you have available invincibility credits, you can press the left fire button to become invincible for 5 seconds. During this period, you will not lose a life if your square makes contact with any of the enemy squares. If you have available hyperspace credits, you can press the right fire button to activate the hyperspace. Your square will be moved to a new location in the playfield. This is dangerous, however, as you may be placed directly on an enemy square, in which case you will lose a square.